Charlie Vanek is vice president of product management at Blackbaud, leading the strategy for Blackbaud Corporate SolutionsTM and Blackbaud Foundation SolutionsTM. He has been at Blackbaud for five years and loves building software that helps advance the social good movement. Charlie is on the board of directors at Open Eye Figure Theater, a nonprofit in Minneapolis where he lives with his family. He has an M.B.A. from the University of Chicago. 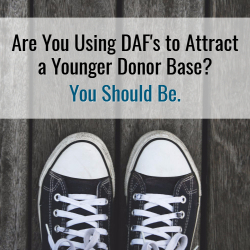 Are You Using DAF’s to Attract a Younger Donor Base? You Should Be. Millennials. Some associate this word with new opportunities: they consume information differently than older audiences, use different evaluation processes to make decisions, and have very different expectations in multiple areas of their lives. For many across the public and private sectors, this word is symbolic of an audience that is hard to attract and retain. Community foundations will rely on millennials, as well as Generation X, for their organizational sustainability going forward, but have experienced many challenges engaging these new donors. Younger generations expect that the organizations they donate to have the technology to answer specific questions around the constituents that benefited from their donation as well as the longer term impact on the community or issue. This movement from checkbook philanthropy to investment-minded philanthropy is a significant change that community foundations need to account for moving forward. It also contributes to a second challenge facing many organizations: how do I make a younger donor emotionally invested in a community they may not have lived in for a significant period, or to remain emotionally invested in a community they have moved away from? Let me ask you a question. Have you considered donor-advised funds (DAFs)? Community foundation-supported DAFs encourage a level of transparency and accountability that is craved by millennials when investing their funds in a philanthropic cause. By investing in a DAF, donors serve in an advisory role, choosing where their money goes and supporting specific issues and causes they care about. Though this level of involvement may cause some uneasiness, this is an opportunity for community foundations to strengthen their relationships with millennial donors by offering expertise on causes and local organizations. This provides an opportunity to gain a great partner, increasing the likelihood they’ll become a recurring donor, especially if your donor management technology enables them to consider and see the direct impact they are making. According to the Council of Foundations, donors are also more likely to serve on your board, or participate in special events sponsored by your community foundation. What a great way to engage those younger donors you will need to serve in leadership positions in the future! Another straightforward and simple reason to consider DAFs: they’re popular. According to the National Philanthropic Trust, grantmaking from DAFs to qualified charities jumped almost 17% from 2014-2015. In 2016, a donor-advised fund, Fidelity Charitable, made headlines when it took the top spot on the Philanthropy 400, a ranking of the US charities that raise the most money. For millennials, DAFs provide an easy way for them to give in a way that allows them to feel more in control of the difference they are making. The Nonprofit Times acknowledges that often this audience wants to make a philanthropic contribution, but is unsure where to give and how much. So, beyond the obvious tax break benefits, community foundations can capitalize on their impact stories when discussing the possibility of DAFs with prospective donors. As demonstrated in the Philanthropy 400 list, the growing popularity of DAFs means they are also being utilized by top firms as investment options. Fidelity, Schwab, and Vanguard are all offering DAFs as financial management options for their clients, again touting the benefits of tax breaks and the high level of flexibility around when clients need to use these funds. While community foundations often see these private sector financial institutions as competition, increased general awareness of DAFs as a result of their mainstreaming could mean less work for your organization when it comes to educating potential donors on what this type of investment looks like. Instead, you can focus on the key differentiators for community foundations: your unique knowledge of the needs of the community, and your experience helping other donors tell their community impact stories. If your community foundation does not yet offer DAFs it’s time for you to join the 80% of your peers that do (2014 Urban Institute Center on Nonprofits and Philanthropy). If you are part of the 80%, that’s great! Continue to share the unique benefits a community foundation DAF can offer donors, and make sure you have the technology that give millennials the experience they expect, and that can tell your donors the impact stories they are looking for..